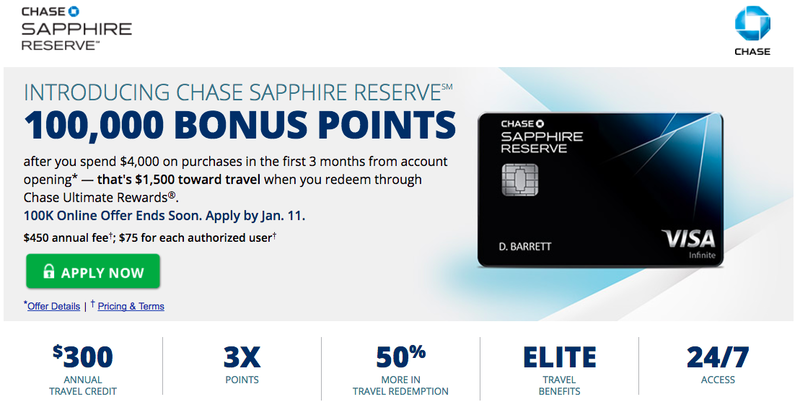 Relentless Financial Improvement: 100,000 Ultimate Reward points with the Chase Sapphire Reserve credit card - this time for my wife! 100,000 Ultimate Reward points with the Chase Sapphire Reserve credit card - this time for my wife! In case you haven’t read the news on all of the credit card blogs and forums, the 100,000 point Chase Sapphire Reserve bonus offer is set to expire on January 12th online and March 12th in bank branch! When this card first came out, I was super excited and applied for it right away. My wife wasn’t in a hurry to apply for the Sapphire Reserve because we have a nice stash of Chase points already. However since the 100,000 sign up bonus offer is about to expire, it was time for my wife to apply ASAP! If you want to sign up for this offer online, you need to apply by January 11th. The Chase Sapphire Reserve card is hands down the best premium travel card on the market currently. This card earns 3x points at restaurants and on travel purchases. The card offers a lot of unique benefits including lounge access with unlimited guest access, $300 yearly travel credit, free Global Entry or TSA Precheck (up to $100 value), roadside assistance up to 4 times a year with $50 credit per incident, and much more. See this Chase Sapphire Reserve review from Doctor of Credit for a complete rundown of benefits and features of the CSR. The best part of this card is definitely the hot 100,000 point sign up bonus after spending $4,000 within 3 months. This is the easiest and fastest way to earn this many Chase Ultimate Rewards points. I would value this sign up bonus at over $1,500 value. The annual fee of the Chase Sapphire Reserve credit card is $450, which is quite a bit if you look only at the fee itself. Looking deeper into the benefits, I would give this card more value than the American Express Platinum card, which also has an annual fee of $450. Owning this card for the first year is definitely worth it. You effectively get $600 worth of travel credit ($300 per calendar year – 2017 and 2018). You get Global Entry, a $100 value. You get an unbeatable 100,000 point sign up bonus. Lounge access is also much better with the Sapphire Reserve than the Platinum card because the CSR allows unlimited guests while the Platinum card only allows the cardholder access. There are some reasons NOT to apply for the card. If you have opened 5 or more credit cards from ANY bank within the last 2 years, you will likely get denied unless you get pre-approval in branch (must speak to a Chase banker) or prequalified online (you can find out after logging into the Chase website). Chase has a new credit score tracker called Credit Journey. Once you enroll, you can see exactly how many new credit card accounts you have had opened in the last 2 years. I would not apply for this card if you don’t travel enough to take advantage of the $300 travel credit. I would definitely not apply for this card if you have ANY credit card debt or don’t feel comfortable paying for a card with a $450 annual fee. You can always wait until March 11th to apply for the Sapphire Reserve card in a bank branch. For us, we’d rather not talk to any Chase rep in person and get sales pitches from them. It’s much less time consuming to apply and get approved online than drive to a local Chase bank branch. My wife is excited to receive her Chase Sapphire Reserve card, her first card application of 2017. It’ll be great to have $600 travel credit this year ($300 for each of us). We are already thinking about our next free international trip! You can apply for your own Sapphire Reserve card here.